The Series RHP-W Wall Mount Humidity/Temperature/Dew Point Transmitter is the most versatile room transmitter on the market. 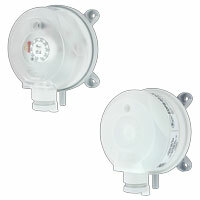 The stylish housing is well vented to provide air flow across the sensor to improve measurement accuracy. An optional LCD display can be integral to the transmitter or a remote display can be ordered for building balancing or LEED® validation. The LCD display indicates the ambient temperature along with the humidity or dew point. The transmitter has internal dip switches to select the temperature engineering units and whether the transmitter outputs humidity or dew point. The humidity and temperature sensors are field replaceable to reduce service cost and inventory. The humidity and the dew point are measured using a capacitive polymer sensor that completely recovers from 100% saturation. The humidity and dew point can have either a current or voltage output, while the optional temperature output can be a current, voltage, RTD or thermistor. 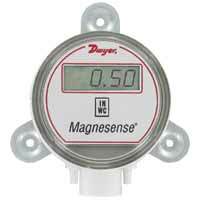 For models with current or voltage for the temperature output, the temperature range is field selectable. For models with resistive thermistors or RTD outputs, please click here for temperature to resistance lookup tables. Solid state band gap temperature sensor: ±0.9°F @ 77°F (±0.3°C @ 25°C). Output Signal: 4-20 mA, 2 channels for humidity/solid state temperature sensor models (loop powered on RH). Switch selectable RH/dew point. Switch selectable normal or reverse output. 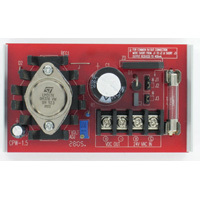 >Power Requirements: 15-35 VDC or 15-29 VAC. Output Load: 5 mA max., 2 channels for humidity/solid state temperature sensor models. Switch selectable 0-10V/2-10V or 0-5V/1-5V output. Switch selectable RH/dew point. Switch selectable normal or reverse output. Switch selectable, -20 to 140°F (-28.9 to 60°C); 0 to 100°F (-17.8 to 37.8°C); 40 to 90°F (4.4 to 32.3°C); -4 to 140°F (-20 to 60°C). (See R-T Lookup Table). Optional LCD, backlit on 0-5/10V models. Switch selectable %RH or dew point, °F/°C. EXAMPLE RHP 2 W 1 0 LCD Series RHP-2W10-LCD Wall Mount Humidity/Temperature/Dew Point Transmitter, 2% accuracy, wall mount, 4-20 mA output, with LCD.